Media & Movie player. This incredible value in-car entertainment system fully supports MPEG and AVI digital movie and media files as well as high resolution. Easy to fit over front headrests, these quality screens can easily be removed and stored. Use one or both, the choice is yours! We are able to tint any vehicle with a quick turn around. We offer a fully mobile service to your home, place of work or a garage of your choice at a time that suits you. Different levels of tint are available to suit your taste. mat comes with a double thick heel pad to prolong its life and anti-slip granular rubber backing. We fit parking sensors to any vehicle. Supplied, colour coded and fitted. 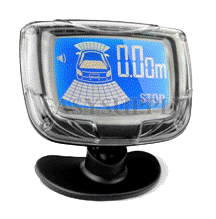 Backup parking sensor with LCD display. 8 sensor system with simultaneous front and rear distance. Accurate to 0.00M display when reversing. This is a new generation parking sensor kit with a whole new design of display. We supply Witter, Westfalia and Thule Brink tow bars and offer a range of flange tow bars, detachable tow bars and retractable tow bars all with a lifetime guarantee. These tow bars are usually the manufacturers specified original equipment. Cycle carriers and trailers are also available.